"Corded+Cordless+Answer Machine + Emergency Button"
Enjoy the daily convenience of loud, clear calls, easy-to-see buttons and big LCD display, in addition to a speakerphone and built-in answering machine. Plus, an included cordless handset lets you expand the system into another room in your home, and the shaker wrist band alerts you of incoming calls, and also allows you to call for help in case of an emergency! The PowerTel 785 is the most versatile amplified emergency phone on the market. 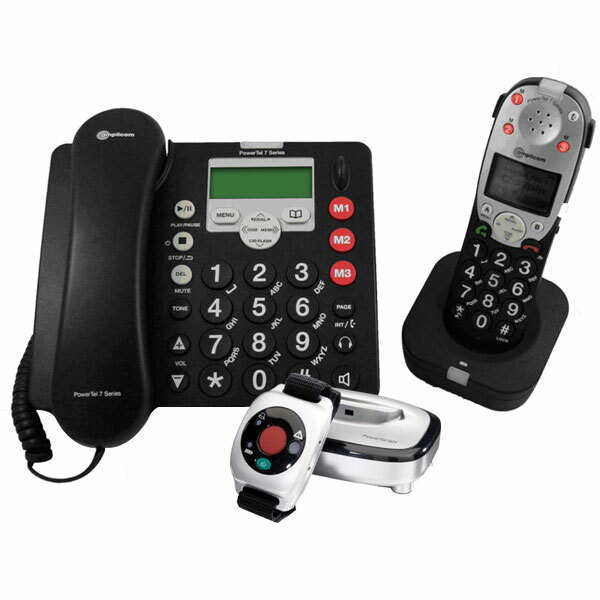 Featuring the unique amplified corded/cordless pairing plus a multipurpose alarm transmitter, the 785 is the perfect solution for those who need quick dialing or easy answering. Besides the flexibility to talk on either amplified handset, in the case of an emergency, the user can activate the alarm button on the splash-proof wrist device which will dial out pre-programmed numbers at the touch of a button. Additionally, users can be notified of incoming calls through a vibration of the wrist device, and can even remotely answer calls by activating the speakerphone on the base of the corded phone with the touch of a button. Both handsets have talk-back buttons and Caller ID Announce. 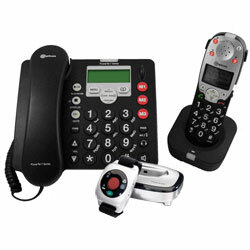 The big button corded base has an integrated digital answering machine while big button cordless handset incorporates crystal clear DECT 6.0 technology for inference-free conversations. With superior hearing aid compatibility that meets and exceeds the TIA-1083 standard, the 785 produces crystal clear communication with less than 1.5-percent distortion. Amplicom's new PowerTel 7-Series are the only amplified telephones that offer pre-programmed, multiple user profile buttons that memorize volume, tone control, and boost for more than one user. Includes one Amplified Corded Telephone with Integrated Answering Machine, one DECT 6.0 Cordless Handset and one DECT 6.0 Alarm Transmitter with Emergency Button. Add additional PowerTel 701 cordless handsets or PowerTel 601 wireless wrist shakers with remote answer and emergency features (extra handsets and wrist shakers sold separately), to expand your system.